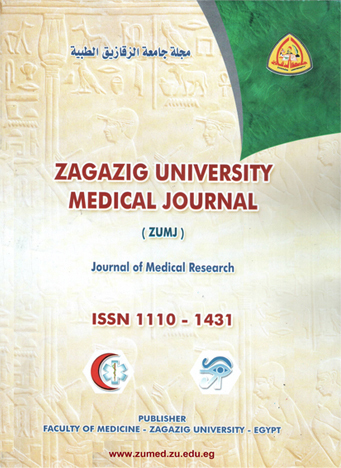 Department of Pathology, Faculty of Medicine, Zagazig University. Background and aim: The material of this study comprises 57 gastric biopsies including paraffin blocks selected from the archives of Pathology Department, Faculty of medicine, Zagazig University in addition to 10 freshly randomly selected endoscopic biopsies were obtained from the Endoscopy Unit of Tropical Medicine department, Faculty of Medicine, Zagazig University hospital in the period from 2011-2013 to examine the expression of CDX2,MUC2 and MUC6 in cases of chronic gastritis, gastric metaplasia, gastric dysplasia and cancer and study the role of these markers as predictors of progression of chronic gastritis to carcinoma. Methods: Immunohistochemical analysis of CDX2, MUC2 and MUC6 was performed using 50 cases for chronic superficial gastritis, chronic atrophic gastritis, chronic atrophic gastritis with intestinal metaplasia, gastric dysplasia and gastric cancer. Results: CDX2 and MUC2 were negative in 11/11 cases of chronic superficial and chronic atrophic gastritis on the other hand, CDX2 was positive in 3/3 cases of complete intestinal metaplasia while CDX2 was positive in 10/12 cases of incomplete intestinal metaplasia. CDX2 was positive in 6/8 cases of low grade dysplasia and 2/4 cases of high grade dysplasia. CDX2 was positive in 62.5% of cases of gastric adenocarcinoma and was positive in 2/2 cases of mucinous carcinoma. 2 /2 of signet ring carcinomas showed negative CDX2 expression. MUC2 was positive in all cases of complete and incomplete IM (3/3 and 12/12 respectively). MUC2 was positive in 7/8 cases of low grade dysplasia and 2/4 cases of high grade dysplasia. MUC2 was positive in 50% of cases of gastric adenocarcinoma. MUC2 was positive in all studied cases of mucinous carcinoma. 2 /2 of signet ring carcinomas showed negative MUC2 expression. MUC6 was positive in 11/11 cases of chronic superficial and chronic atrophic gastritis. It was positive in 11 cases of incomplete intestinal metaplasia. MUC6 was positive in 1 case of low grade dysplasia and 1case of high grade dysplasia and 5 cases of gastric cancer but all 3 cases of complete intestinal metaplasia showed negative MUC6 expression. MUC6 was positive in 37.5% of cases of gastric adenocarcinoma and in 2/2 cases of signet ring carcinomas. MUC6 expression was negative in studied 2 cases of mucinous carcinoma.